The shallow patch reefs of the Coffins Patch Sanctuary Preservation Area (SPA), located approximately four nautical miles off Key Colony Beach, offer some of the best snorkeling in the Middle Keys. Tangs, jacks, stingrays, nurse sharks, grouper, lobster, butterflyfish, and the curious moray all call Coffins Patch home, plying the easy currents among soft corals, up to three-foot round boulder coral, and some of the prettiest patches of pillar coral in the area. Pillar coral may be found at the west end of the SPA at a depth of 25 feet. 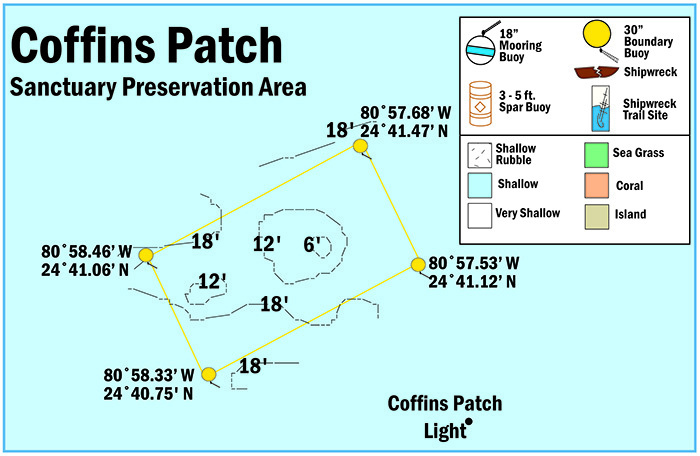 View a map showing the location of morring buoys within Coffins Patch Sanctuary Preservation Area.